Today¡Çs Tickets Center (TTC) is the first ticket sales booth in Japan that sells day-of-show tickets for events. We mainly sell tickets for events that take place within the Osaka-Kyoto-Kobe region. New York's TKTS is a well-known example that uses the integrated system of selling day-of-show tickets over the counter. TTC is run by an NPO to promote Kansais live entertainment culture. The booth caters to both national and international visitors in Osaka, who have strong interest in the cultural arts. You might be able to purchase tickets for the sold-out show you wanted to see. Pick from a variety of events! Select and purchase from a wide range of day-of-show events. Depending on the event, student and or tourist discounts may be available (with valid ID). Please come to our booth located at the Osaka Visitors' Information Center, Umeda at the JR Osaka station. We are open from 10:00 until 18:00. Please select the ticket for the event you would like to attend and make the payment. In exchange, you will receive a voucher (a paper that proves your purchase). *We do not sell the actual ticket that allows entry for the event. All vouchers need to be exchanged at the venue (see Step 3). When arriving at the event venue, please show the voucher at the reception desk. The venue may give you a ticket in exchange and or usher you to your seat. Procedures after the voucher is exchanged will depend on each venue. In general, no monetary transaction will take place at the venue. Our business hours are from 10:00 until 18:00. Please note that ticket sales will end, regardless of business hours, when the actual event starts within 1 (one) hour, or when the number of tickets available have sold out. We cannot accept any exchanges, change of show time, reissuing, or cancellations for vouchers that have been issued. Please be careful not to lose the voucher or get it wet. Selling or giving the ticket away to someone else is not permitted. Depending on the event, we may hand you a paper wrist band that provides personal authentification with the voucher. We may ask for personal identification in the form of a passport, driver's license, or student ID. Due to our system, we cannot make specific seating arrangements. Discounts: Depending on the event, there may be discounts available (i.e. student discount). Please ask us at the booth. Event Details: For further information about the events, please make a direct inquiry to the organizers. Q.Who runs TODAY'S TICKETS CENTER? A.NPO Live Entertainment runs TODAY'S TICKETS CENTER. Q.Can you tell us what tickets are avilable in advance? A.We are currently working on developing a system that distributes the ticket information. At current point, the best method is to visit the booth and select from the available tickets. Q.Can I use a credit card? A.We do not accept any credit cards. Payments are cash only. Q.Can I purchase tickets for tomorrow? A.No, we only handle tickets for events taking place on the same day. Q.Can you put tickets on hold? A.We are sorry, but we do not put any tickets on hold or accept any reservations. Q.Can I choose my seat? A.Due to our system, we are unable to provide any specific seating arrangements. 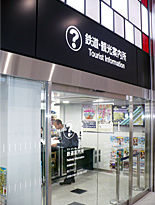 Access information to Today's Tickets Center:Osaka Visitors' Information Center, Umeda. Copyright © 2010 TODAY'S TICKETS CENTER All Rights Reserved.